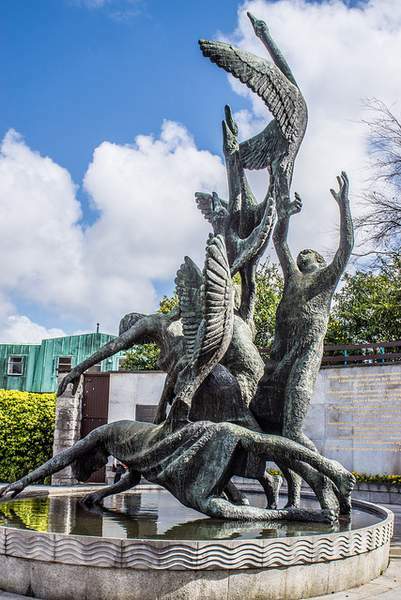 The Children of Lir is an old Irish legend I have loved ever since I was a little girl growing up in Dublin. I listened enraptured as my grandaunt Nan told the tale of the four children who were turned into swans by their jealous stepmother, Aoife. Today let’s explore this wonderful, yet sad Irish tale from days gone by. To mark the importance of the Children of Lir in Irish folklore and history, we’ll have a little giveaway for a magnificent pendant designed by Tracy Gilbert, an outstandingly skilled Irish jeweler. Tracy will introduce her work in just a little while, but first let’s learn about the Children of Lir…..
A long, long time ago in Ireland there a lived a King called Lir who had four wonderful children whom he loved dearly. Fionnuala (pronounced Fin-ool-ah), Fiachra (pronounced Fee-ah-kra), Aodh (pronounced Eh), and Conn (pronounced Kahn) lost their mother when they were young. They missed her stories and singing so much King Lir decided they needed a new mother. 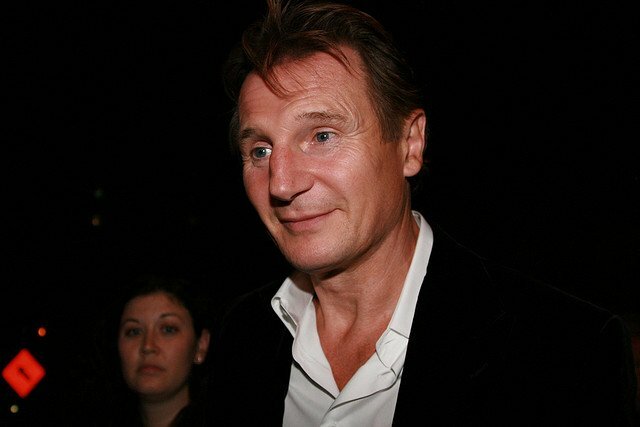 He married his late wife’s sister, Aoife. At first she loved the children but over time she grew jealous of how much the king loved his children. 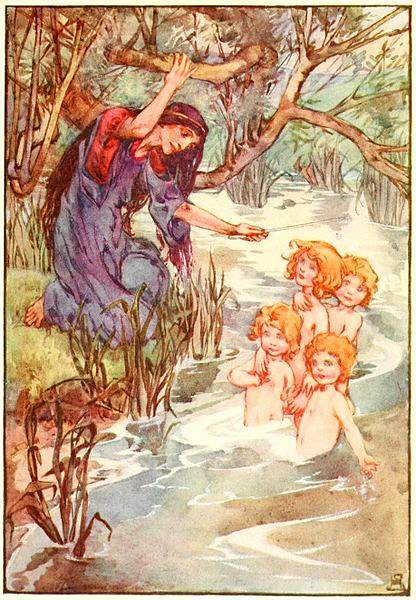 One day, as the children swam in Lake Derravaragh, Aoife cast a spell on them, turning them into swans. Although they were no longer human they retained their mystical singing voices. Aoife’s spell forced them to live as swans for nine hundred years. She bade them spend three hundred years on Lake Derravaragh, three hundred years on the Sea of Moyle and three hundred years on the Island of Glora. Only the sound of a bell would break the spell. Their father Lir learned of the singing swans, and soon reconnected with his children. He turned their wicked stepmother into mist upon learning of her cruel spell. The first 300 years on Lake Derravaragh were happy in the company of their father. Once they bade goodbye to him, 300 years of sorrow awaited them on the fierce waves of the Sea of Moyle, which separates Ireland from Scotland. 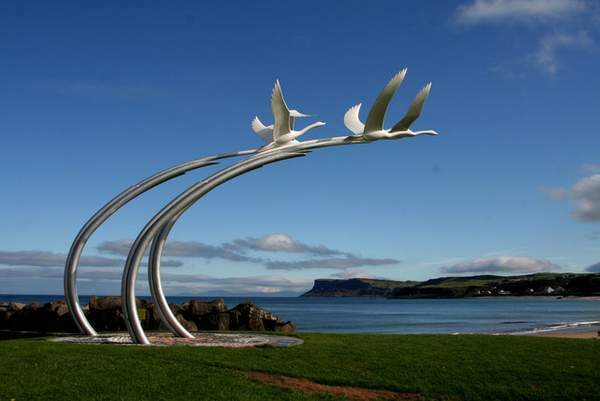 The Children of Lir at Ballycastle, County Antrim flying out to the Sea of Moyle. © Copyright Patrick Baldwin and licensed for reuse under Creative Commons License. 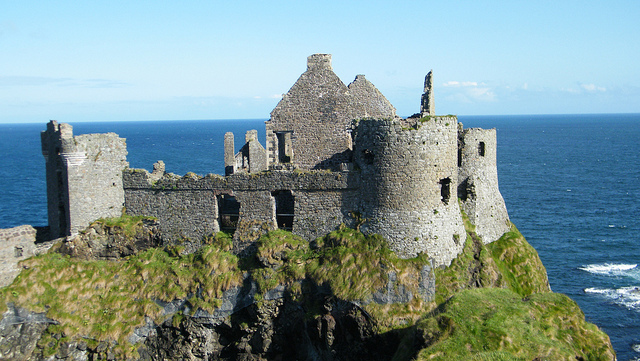 When they returned to Ireland they discovered their father had passed away and his castle was now in ruins. Their last 300 years were were spent on the Island of Glora where in the final years of the spell they met a holy man named Caomhóg (pronounced Kway-vohg). The King of Connacht learned of their beautiful singing voices. He tried to capture them, but upon hearing Caomhóg’s bell, a mist descended and the swans regained their human forms. At first they were children, but they aged rapidly. Before they died Caomhóg christened them, and their legend has lived on ever since, being passed down from generation to generation through the spoken annals of ancient Celtic folklore. This tale might be considered way too sad for American children today, but as Irish children we grew up on tales of treachery, sorrow, magically mixed together with Celtic mysticism. And I continue to share these legends with my children. A little bit of sorrow does them no harm at all. Swans are plentiful in Ireland in the winter months. Swans are never killed by hunters, because they are revered in Celtic legends, like the Children of Lir. 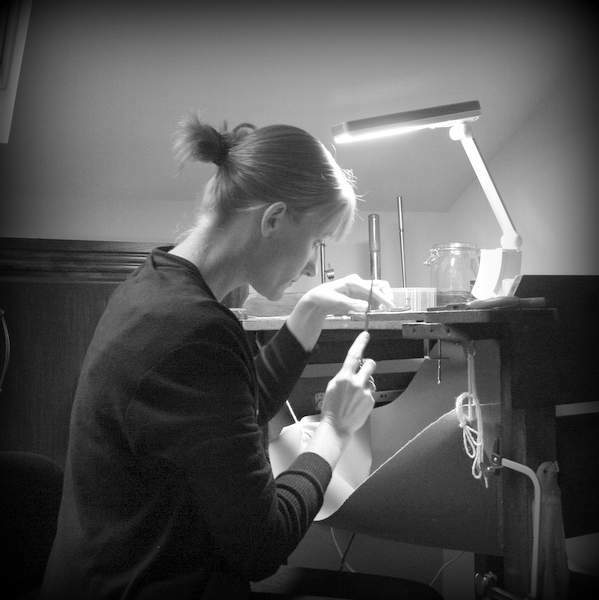 Tracy Gilbert is a Dublin-based designer and maker of beautifully hand-crafted contemporary Irish jewelry. Tracy not only makes beautiful things in Ireland, she also makes Ireland into beautiful things. The map of Ireland features in many pieces. Turn a piece from the ‘Growing Home’ collection in just the right way, to reveal a perfectly formed map of Ireland. Tracy is immensely proud of her Irish heritage. She was educated through the Irish language and has always been inspired by the rich artistic and mythological history of Ireland. Each piece is meticulously made with love for Irish roots, history and folklore. The meanings attaching to Tracy’s pieces are very important to her. 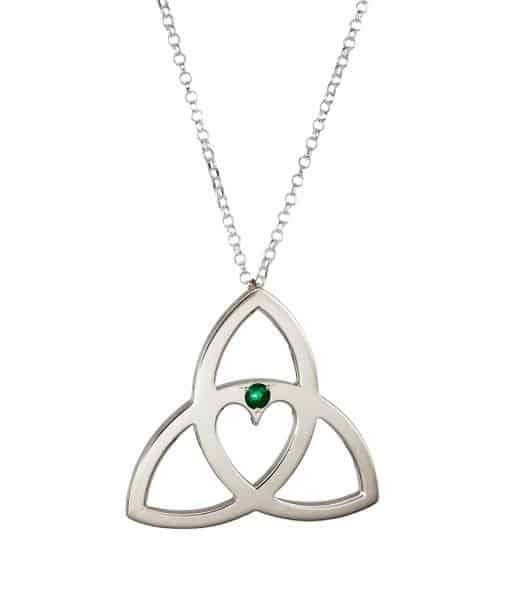 Tracy’s very first design, the Celtic Trinity Heart pendant, was made for somebody very special and is a simple reworking of the traditional Celtic Trinity knot. The addition of the heart in the middle of the knot symbolises ‘Forever love’. Tracy’s Growing Home collection is a reimagined ‘Tree of Life’ with Ireland represented as a beautiful oak tree – strong and enduring (rotate the piece anti-clockwise and you’ll see that the canopy of the tree is indeed a map of Ireland). 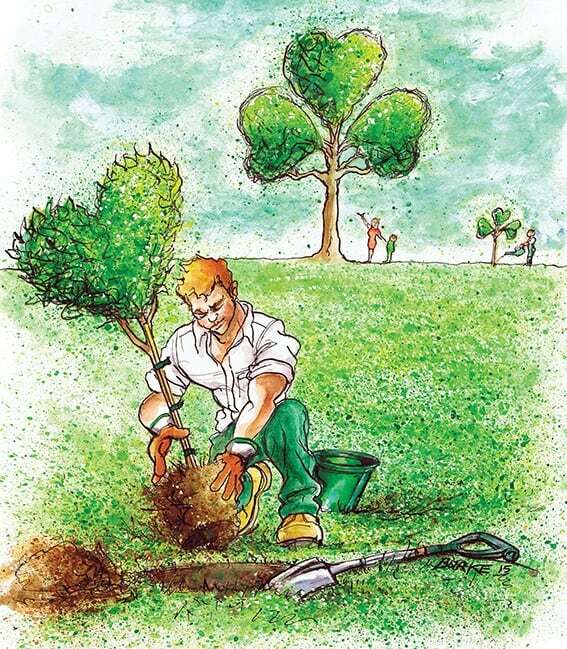 Like most trees, it has weathered many storms but continues to grow strong, it is deeply rooted. 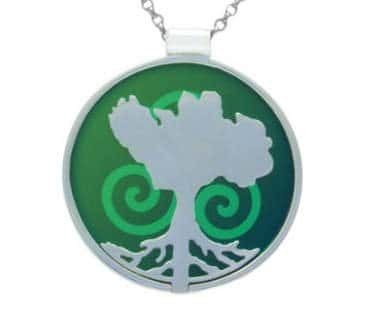 It also reflects the wearers ancestry, with roots firmly planted in Ireland. Also, that Ireland as a nation continues to grow and will provide shelter to her people no matter where they are living. 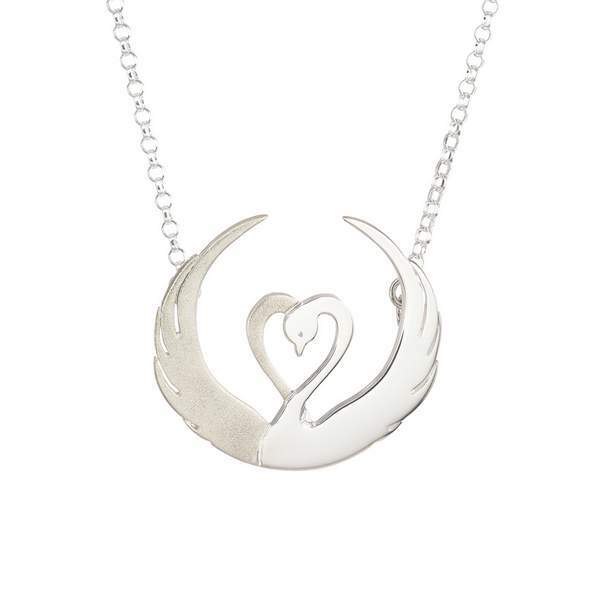 Tracy’s Children of Lir collection is inspired by the tale, in Irish folklore, of four siblings who were turned into swans for 900 years by their stepmother, jealous of the children’s love for each other and their father, Lir. The swans are entwined to form a heart, symbolizing love and dedication. You can view all of Tracy’s pieces on her website Tracy Gilbert Designs. You can follow her stories and design updates on Facebook and Twitter. One lucky reader will win a beautiful sterling silver pendant, inspired by the Irish tale of the Children of Lir. 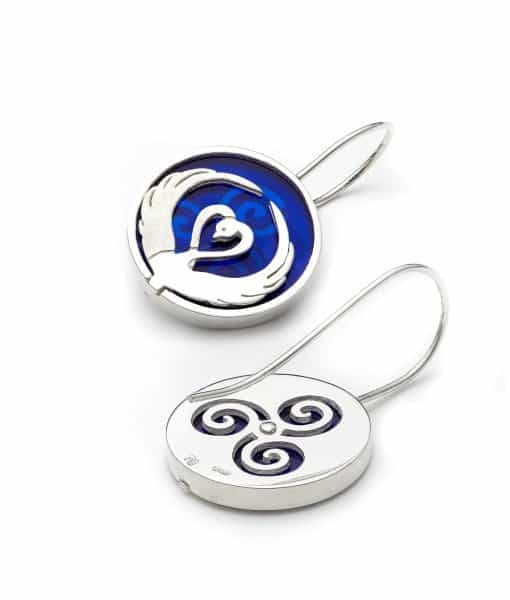 A pair of swans intertwine to reveal a heart of love and devotion, highlighted by stunningly blue Celtic waves. Valued at €175.00 this piece is a perfect gift for any lover of Irish legends and Ireland. A big thank you to Tracy for sponsoring the prize for this giveaway, in perfect time for Christmas. 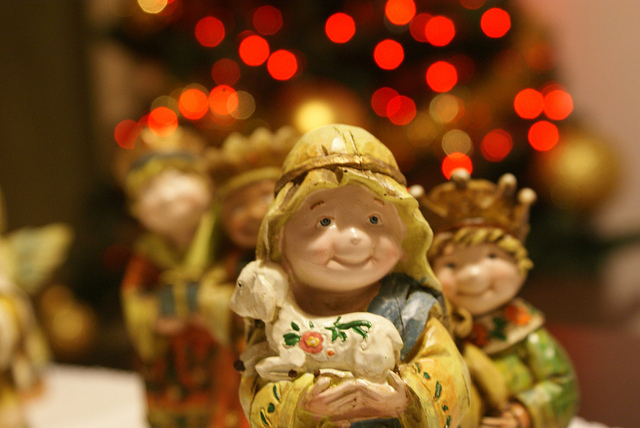 To enter just leave a comment on this blog post by noon on Wednesday, December 16th 2015. Any comment will do. What you write does not affect your chance of winning, but if you need inspiration for your entry why not tell us about your favorite characters from Irish history, that might inspire Tracy in her future jewelry designs. Winners will be announced on Wednesday December 16th, 2015, at the bottom of this blog post. You may check out Irish American Mom’s complete terms and conditions for sweepstakes entries by clicking here. A big thank you to Tracy for sharing her inspiring jewelry with us today. And thanks to everyone who supports this little giveaway. Best of luck to all the entrants. And a big thank you to Tracy Gilbert for introducing us to her beautiful work and for sponsoring this magnificent prize. I love sharing success stories with an Irish twist and today I’m delighted to share some wonderful news of Emerald Heritage’s ongoing accomplishments and accolades. This year Emerald Heritage will reach a global audience of 60 million viewers when it is featured on two international travel programs. The Glens of Antrim earned a well deserved place on a list of world’s most exciting locations according to US Travel Channel and Luxury Channel AWE TV. 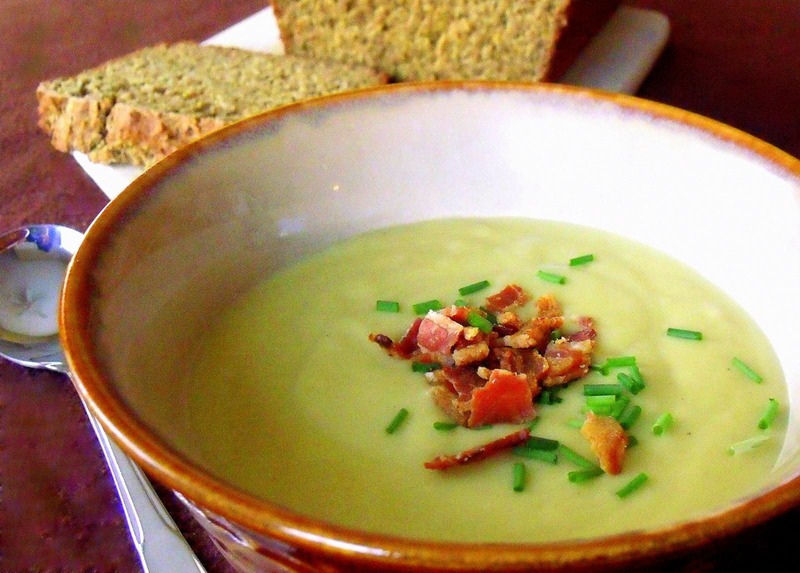 Emerald Heritage, a social enterprise based in the Glens of Antrim, was established in 2014. This family-business hit on the idea of selling small plots of land in the stunning hillsides of the Glens, and reinvesting the profits to reverse the serious deforestation of native Irish woodlands. We explored their work together in previous posts about their conservation goals, and their tree planting program. A big thanks to many of you who have supported their work. They have gone from strength to strength. It’s lovely to report once again on their plans and ambitions for protecting this beautiful part of Ireland. Emerald Heritage was formed by Irish people for Irish people in response to the erosion of both Ireland’s landscape and aspects of our shared culture. Not content to sit back as great swathes of Ireland’s natural habitat and history was put to the sword, never to return, Emerald Heritage decided to act. For an island famed for its sublime scenery and emerald hue it may come as a surprise to many to learn that Ireland is the least wooded country in Europe with just 1% of our native woodland remaining. Centuries of unchecked development has resulted in this sad statistic and unless something is done the landscape, together with the plants, birds, and animals that call it home, will be lost forever. Emerald Heritage’s creative conservation concept has caught the attention of senior staff in PBS Media who have featured their work in two top rated travel programs. ‘Jet Set’ and ‘Travel in Style’ are broadcast in Ultra HD to more than 60 million viewers in the US, Russia, China and the Middle East, and will now give viewers across the globe a little glimpse of Ireland. 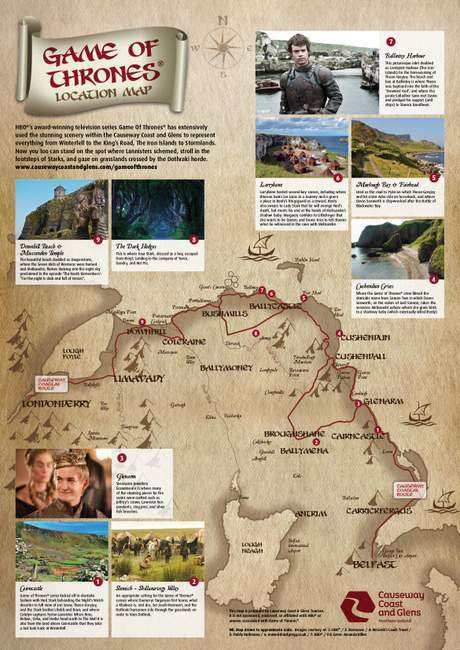 Scenes at Ballygally Castle Hotel, the Causeway Coastal Route and locations used in Game of Thrones feature prominently in the shows. 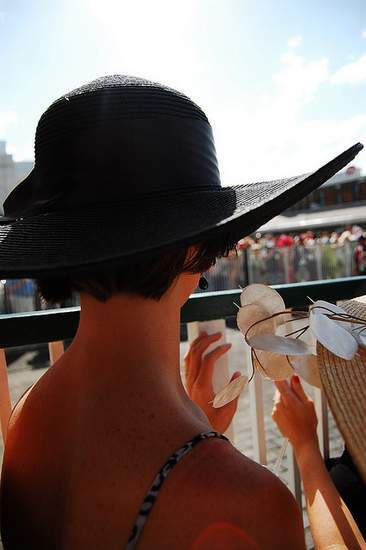 The Glens area saw off stiff competition from several luxury destinations around the world to join Monaco, Venice and Mauritius on this exclusive list of most exciting places. and for the wider Causeway Coast and Glens area. it’s not hard to see what keeps bringing them back year on year. an adventure around each corner. Many viewers of these PBS programs may not realize they have seen these hills and glens, coasts and ocean views before. Emerald Heritage lands are located near where scenes of the TV smash Game of Thrones are filmed. Believe it or not U.S. Game of Thrones’ fans are rushing to snap up land in Northern Ireland’s Glens of Antrim, and the more people who buy a little plot of Irish land, the more land can be preserved and restored. The complete map and driving itneraries can be downloaded from the Causeway Coast and Glens website. Owners of Emerald Heritage say the phenomenal success of the Game of Thrones series – much of which is filmed at locations throughout North Antrim – has led to a deluge of fans snapping up their own little slice of the area for an affordable US$50. 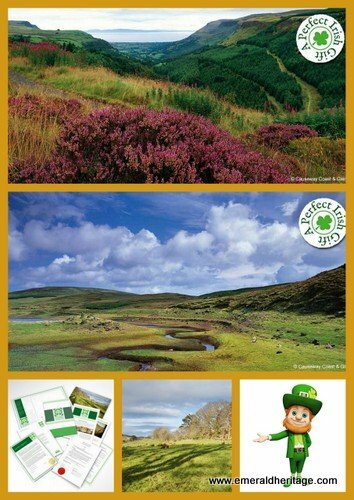 As well as gaining a unique souvenir, buyers become legally certified owners of Irish land which allows them to use the ancient Irish tradition title of ‘Squireen’, or ‘Squire’ in English meaning ‘Irish Landowner’. as it is showcased in one of the most popular programs in the world. The PBS crew met with a warm welcome in County Antrim, with Lyn’s team eager to showcase the incredible locations on their doorstep. So why not watch out for these episodes of ‘Jet Set’ and ‘Travel in Style’ which will air in the coming weeks. You can learn more on the Emerald Heritage website. A Quick Note and Legal Disclaimer: If you choose to utilize the discount code listed below I will earn a commission for your land purchase. If you have any questions you can contact me or leave a comment, and I’ll do my very best to reply. Wishing Lyn and her team every success as they share the scenery, stories and warmth of Ireland with a global viewing audience. 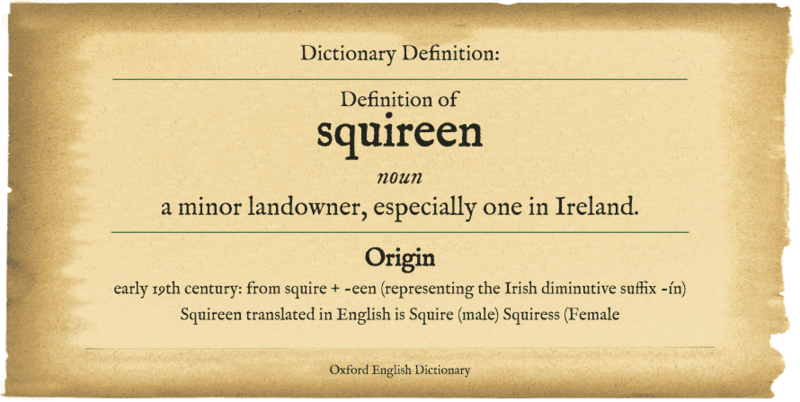 And may all new Squireens and Squiresses enjoy their very own little piece of the Emerald Isle, knowing their purchase is helping to preserve the beauty and heritage of our magnificent island. 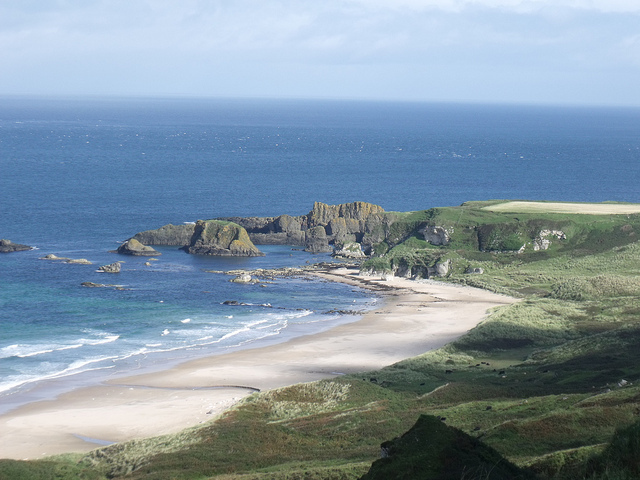 County Antrim boasts a magnificent coastline. The Causeway Coastal Route spans its ocean perimeter, passing through some of the most spectacular scenery in all of Ireland and Europe. Today I have chosen to share a few photos of this beautiful county. 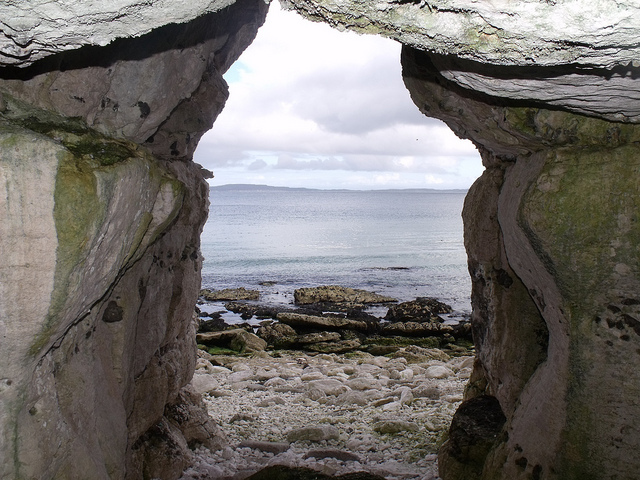 There are many sites I have omitted since time and space only allow a “wee peek” at County Antrim’s splendor. 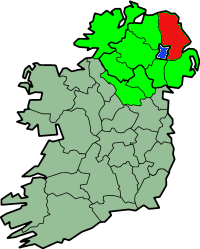 Situated in the northeast corner of the island, Co. Antrim is part of the nine counties of Ulster, and one of the six counties of Northern Ireland, and part of the United Kingdom. 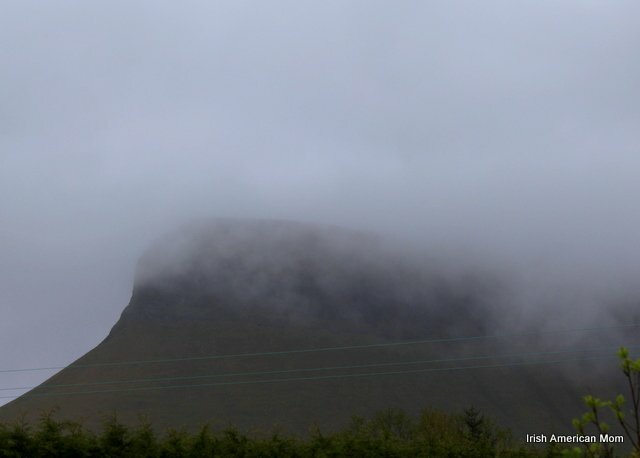 Man initially crossed to Ireland from Scotland, making Antrim the first site of human settlement on the island. Stunning rock formations line pebbled shores. Dunluce Castle, a ruined, evocative medieval castle, is perched majestically atop a rocky outcrop high above the Atlantic ocean swells. It dates back to the 13th century. Reports of a wandering ghost abound, possibly the spirit of a servant lost to sea on a stormy night in 1639 when half the castle kitchen fell into the ocean. 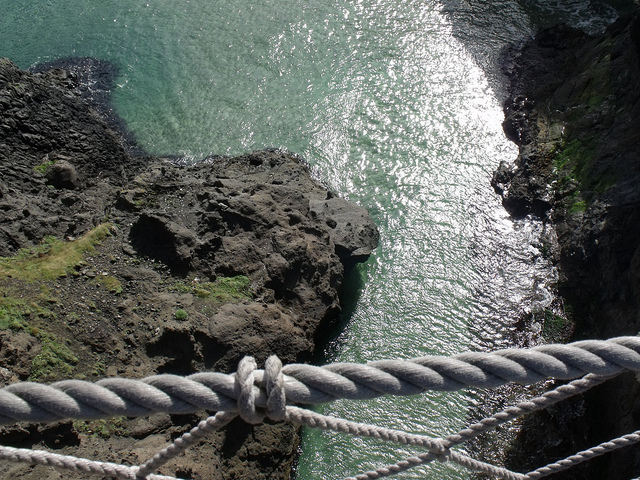 Carrik-a-rede rope bridge spans an ocean inlet, eighty feet above the water. The original structure, with one handrail and widely spaced slats, was not for the faint-hearted. In times gone by, fishermen traversed the bridge with freshly caught salmon. 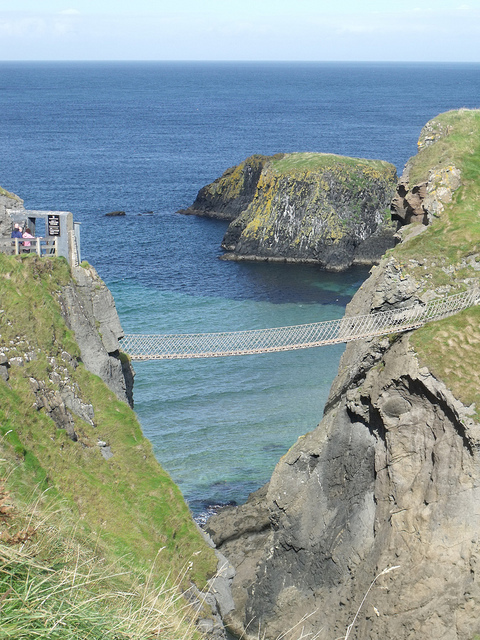 The rope bridge was reconstructed in the year 2000, with two hand rails to grasp firmly with both hands, as you bounce across the chasm. The Giant’s Causeway is one of Ireland’s great natural wonders. 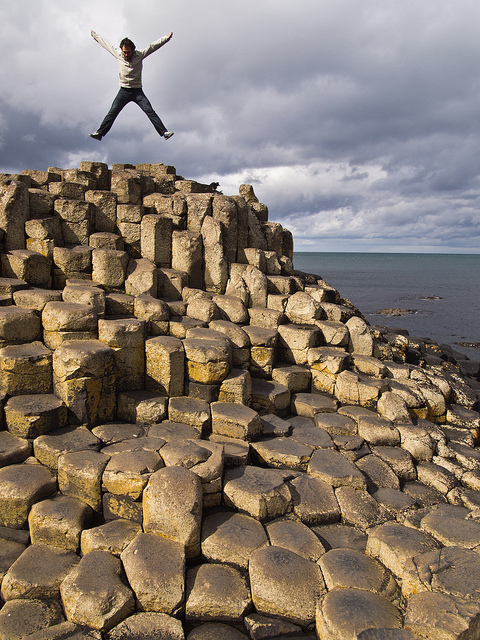 Famous for it’s bizarre, hexaganol, basalt columns leading in a path to the ocean, this four-mile-long stretch of Antrim coastline is a World Heritage Site. Many Irish legends find their roots in County Antrim, a favorite haunt of the mythical Irish giant Finn McCool (Fionn MacCumhaill in Irish). 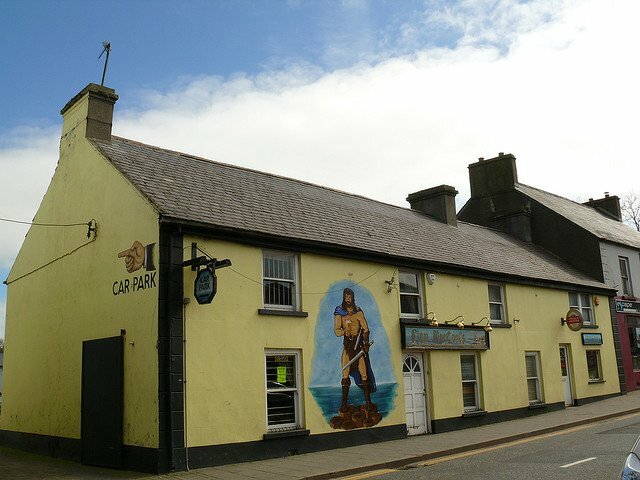 I love the pub mural above, found in the town of Bushmills. If you look closely you will spot a beer glass in Finn’s right hand. Even giants get thirsty and need a pint! 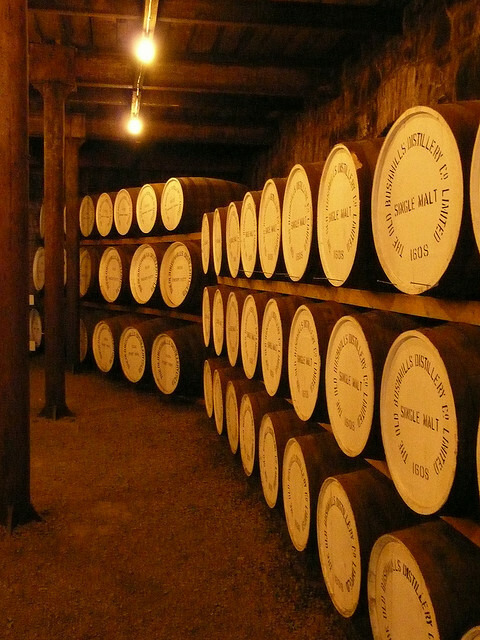 The Bushmills whiskey distillery within the town claims to be the oldest distillery in the world. Tour guides lead visitors through the complete process of whiskey production, including the Irish practice of distilling whiskey a total of three times. The result is supposedly a smoother spirit than Scotch whisky, which is only distilled once or twice. 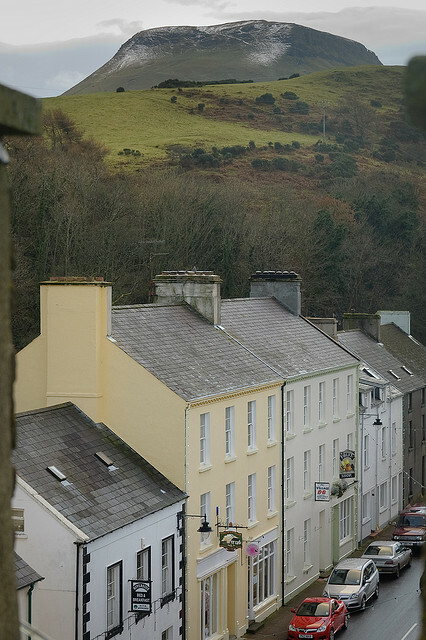 Picturesque towns and villages nestle amongst the hills and glens of Antrim. Portrush resembles a British seaside resort. 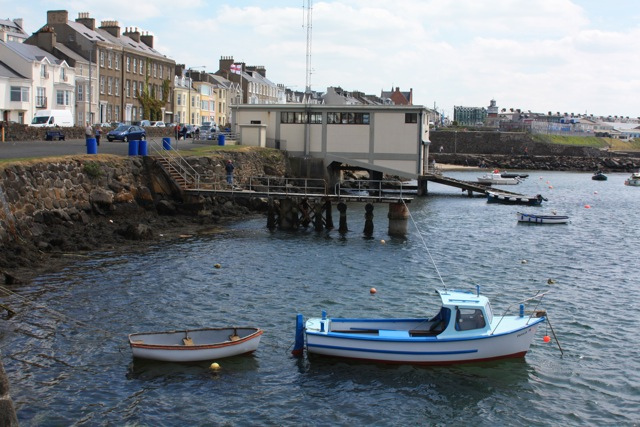 With numerous hotels, guesthouses, restaurants, cafes and bars, Portrush is a perfect base for exploring the Antrim Coast. 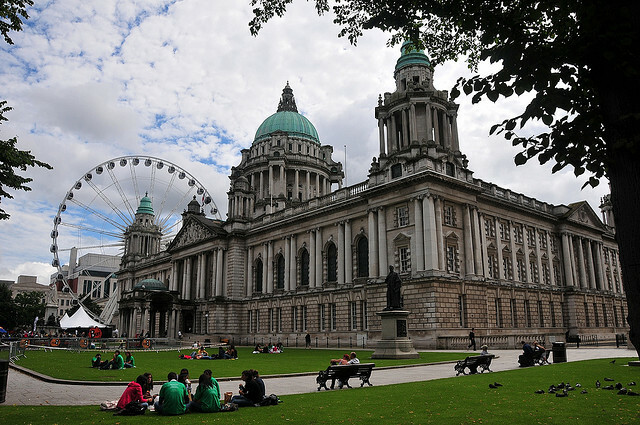 Belfast is the largest city in Northern Ireland, straddling both County Antrim and County Down. City Hall is an impressive structure, built between 1888 and 1906, to commemorate Queen Victoria bestowing the status of city to Belfast. 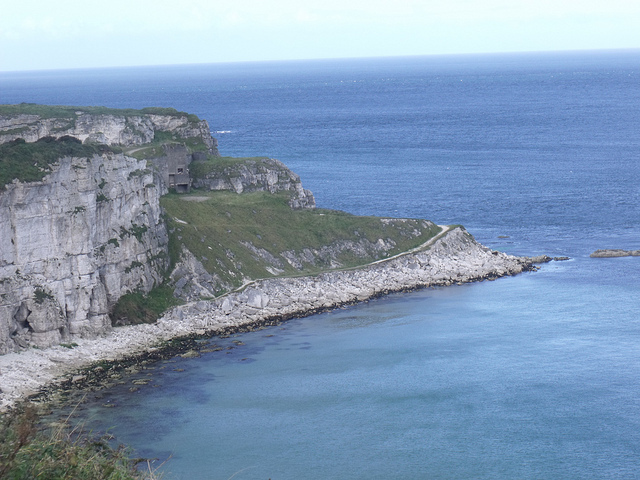 Antrim’s famous sons include Willie John McBride, the Irish rugby player and Liam Neeson of Hollywood fame. 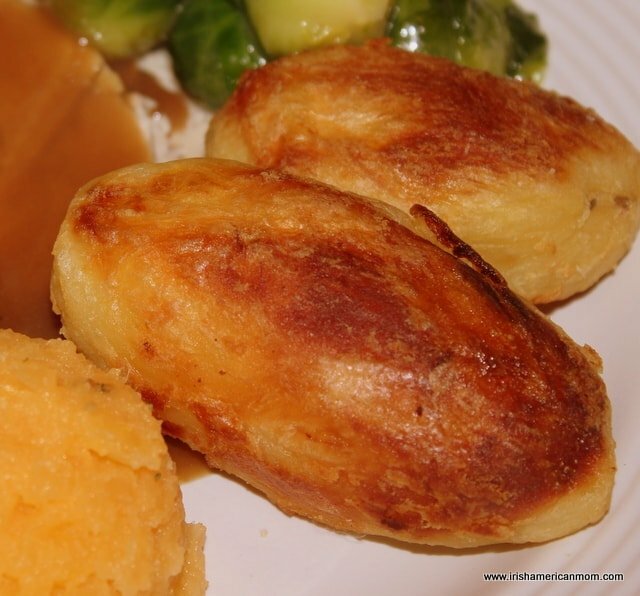 This blog post includes only a few snippets of what Antrim has to offer. Here are some helpful links if you are planning a trip. Wishing you all happy travels in County Antrim.